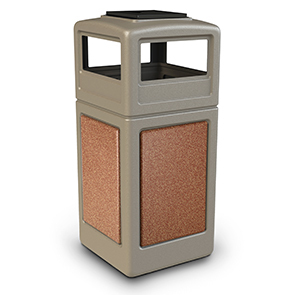 These waste containers are big and beautiful, with a patented Grab Bag™ System and side panels that look and feel like stone. All in one ash and trash design with StoneTec fiberglass reinforced polymer concrete side panel enhancements. The attractive StoneTec panels create an upscale appearance in any location. 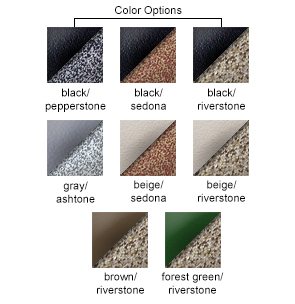 Choose from four popular color combinations. Covered dome lid has easy access on all four sides & integrated ashtray on the top. Powder-Coated steel ashtray unlocks for easy cleaning. Grab Bag™ System secures trash bag. Waste container molded from durable polyethylene. Panels made from fiberglass reinforced concrete.